Horton Hears a Who in this heartwarming scene from the classic children's tale. The lovable elephant Horton gleefully discovers the tiny planet of Whoville and befriends the little community. Beautifully decorated in charming quilt patterns and floral motifs, Horton stands atop a grassy hill as he communicates with his new friends. This unique design captures the magical world of Dr. Seuss and the unmistakable artistry of Jim Shore. 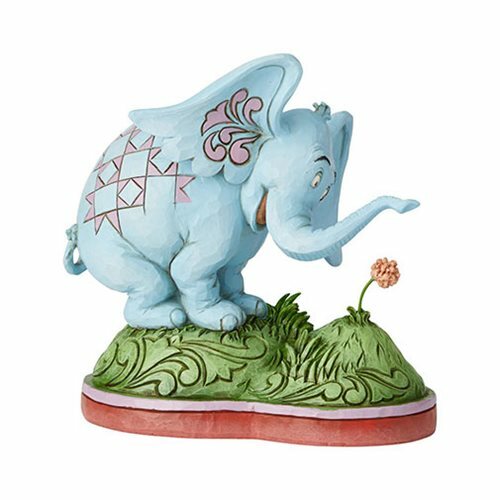 The Dr. Seuss Horton Hears A Who Horton Statue by Jim Shore is made of stone resin. Measures about 5 7/10-inches tall x 5 7/10-incehs long x 3 3/4-inches wide.